Up to a point, water can be used as analogy for electricity. Electrical concepts like battery, resistor and transistor have equivalents in the water-model, namely pump, narrowed-down pipe and valve. The water-model can't be used to explain electrical circuit-theory in full, but in the context of the Qibec CPU, it works well. Electrical circuits are built using wires to connect electrical components, basically in the same way a hydraulic system is built by connecting hydraulic components - e.g. pumps or valves - using pipes. Because of the simplicity of the Qibec CPU, it takes only a few different hydraulic components to explain its fundamentals - simply because the CPU itself uses only a few different electrical components. 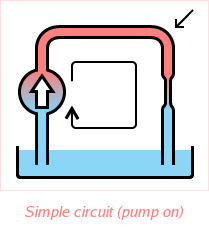 In order to make any interesting water-circuit, there needs to be a component that causes the water to move. That component is a pump. A pump has an input- and output-pipe, and - when powered on - causes a pressure-difference between its input and output. Many of the following examples (using water or electricity) make use of pressure-differences in a circuit to cause an effect. By placing narrowed-down pieces of pipe in a water-circuit, one can control where pressure-differences occur, assuming there is water-flow through such a piece of pipe. If water flows through a narrowed-down piece of pipe, the water-pressure will decrease in the direction of water-flow: the pressure at the entrance of such a piece will be higher than at its exit. A narrowed-down piece of pipe is said to present a resistance to the water-flow. Using only a pump and a narrowed-down piece of pipe, the concept of pressure-difference can be further illustrated. In all these examples, the colour of the water indicates the pressure at that point - red means high; blue means low/atmospheric. For the sake of simplicity, only "high" and "low" pressures are considered - nothing in between. The reservoir at the bottom of each water-circuit has an open top; therefore, the reservoir is always at atmospheric pressure, and therefore, always coloured blue. 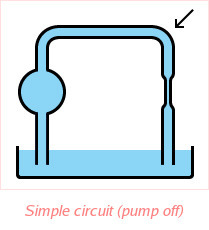 When switched off, the pump doesn't cause a pressure-difference, so that at any point in the circuit, the water will still be at atmospheric pressure. When the pump is switched on, it causes the pressure at its output to rise with respect to its input (which is still at atmospheric pressure). In this new situation, one could say the pressure-difference between the pump's output and input has to be divided among the rest of the components connected in between. In case there was another piece of pipe added in the loop, the pressure in between the 2 pieces would be at half the pressure-difference caused by the pump - each piece would take half of the total pressure-difference.